Alright, I’m going to be a little biased here. 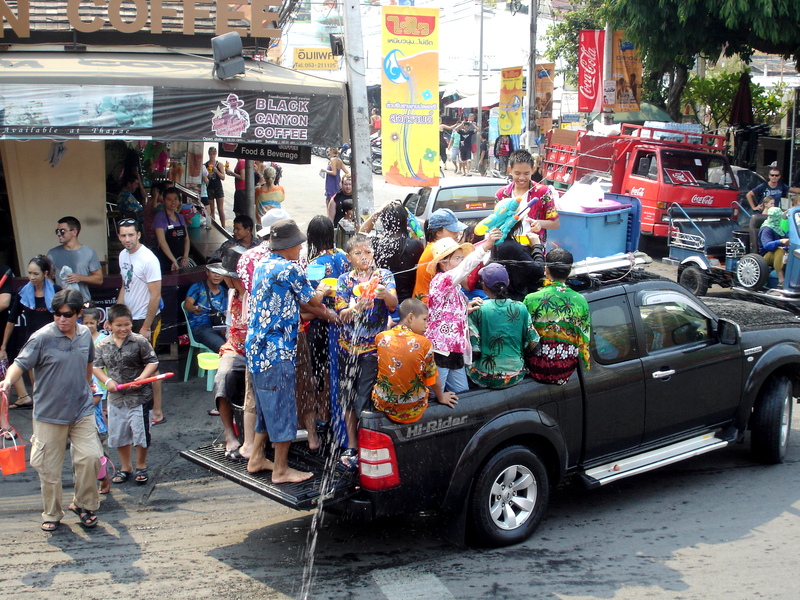 I arrived to Chiang Mai when it is at its best, the New Year’s Festival called Songkran. If you’re in Thailand for this holiday, it is said that Chiang Mai is the place to be. The old city of Chiang Mai is surrounded by a moat. This moat is then used to refill countless and countless buckets and waterguns, which are then used to soak and re-soak every single person in the city. And I mean every single person. Businessmen, shopkeepers, mothers, infants, monks, even policemen are dripping water by 10 o’clock in the morning. I can’t imagine being anywhere else for this holiday! It was an endless supply of water. But more about the holiday later. I want to talk a little bit about the city. Or at least what I saw of it. Most of the shops were closed. And by most, I mean at least 95% of them. Everyone was out “playing Songkran.” But I liked the way the city was structured. It was definitely walkable and I got to stroll down the Sunday Market (which was going on a Friday because of the massive amounts of people inundating the city, and I mean literally inundating) and was tempted to buy anything and everything once again. It seemed like a pretty laid back place with a lot of character. My couchsurfing host showed me all of his favorite restaurants. And yes, he could only show me them, because their owners were out spraying people with hoses, but needless to say, I heard there were some good restaurants. And I’m sure there are a lot of great temples and museums to see there, but I was a little caught up. So my first impressions of Chiang Mai are a little skewed. I thought the city was the greatest place on Earth, but I might have to revisit it away from all the mayhem. Instead of exploring the city, I was captivated by the Thai culture on this amazing holiday! Wow, that sounds awesome. We were Chiang Mai just during any regular old time and absolutely loved it, so I can imagine what it’s like during a festival as big as Songkran. Sounds like you had a blast, and if you make it back there, it’s a great place no matter the time of year. Chiang Mai is truly a wonderful city. Laid back, character, cheap, and friendly people.. No wonder why I chose to stop and live here after my RTW trip! We are actually quite a few travelers settled in Chiang Mai at the moment so it’s great times together stuffing our face with street food! If you ever come by again, feel free to say Hi! Chiang Mai is also a beautiful place to be in novemeber (Loy Khratong festival). I hear that it is absolutely stunning during Loy Krathong! I bet it was nothing compared to my experience of the holiday in my small town (http://thetravelingdreamer.com/2009/11/05/loy-krathong/). I found that a lot of travelers have chosen to settle down in Chiang Mai. What a wonderful place to live! Striving for adventure… getting into it and let the taste and colours of Thailand take your soul away. I’m happy for you Alessandra 🙂 you still have so many years to travel and capture dreams with your writings and photos! Thank you for this emotion! Till next time.. I look forward to many more years! Photography is my passion and I want to shoot everywhere around the world! I loved your quote “let the taste and colours of Thailand take your soul away.” That’s amazing! Ooh I’m quite jealous. What a wonderful time to be in Chiang Mai! It’s the place to celebrate Songkran and goes on for days. But yes, I think you’re right – best to return to Chiang Mai again when you will be able to see the whole of the city. It’s a wonderful place and so different to the mania of Bangkok. Look forward to reading your next post on Chiang Mai!